For Pam Marlin, who serves as the Graduate Program Assistant for the UF Physics Department, an apt motto might come courtesy of William Faulkner: “The past is never dead. It’s not even past.” Because for Ms. Marlin, the history of the people, places, and things around us is what makes life such a rich tapestry of interconnectedness. By day, she is responsible for guiding some 120 physics graduate students through the maze of an academic bureaucracy, making sure the i’s are dotted and the t’s are crossed in a blizzard of paperwork: admissions, budgets, hiring, payroll, tuition waivers, course registration, committees, travel, publications, and, finally, graduation. By night, she researches the past. This all got started with a middle-school fascination with mummies and King Tut. Pam Marlin’s grandfather had moved the family from southern Illinois to Gainesville in 1959, making them now, by modern standards, part of “old” Gainesville. She was born at Alachua General (since torn down), went to Gainesville High (still there), worked at the Gainesville Mall (since torn down), started pursuing her interest in archaeology at Santa Fe College, then got married and had two kids. After children, a succession of academic support jobs at the UF Veterinary School, IFAS, and the Physics Department allowed her to build up experience in the use of technology and social media. She now serves as the department’s webmaster, writes news articles, and posts updates to the department’s web site and Facebook, Instagram, and Twitter accounts. Although the real world intervened in her academic plans, she never lost the love for things dead and gone. Take for instance, her love of cemeteries. “Cemeteries are beautiful and peaceful places. 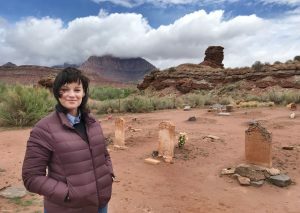 In the old days people would visit cemeteries for their Sunday picnics.” As part of genealogical research on her family’s ancestors, she travels far and wide to visit where they were buried. Her most unusual find was a relative who had died at a Kansas insane asylum in a cemetery plot with no name on the gravestone – something Ms. Marlin hopes to someday remedy. She also likes to visit the graves of famous people. “The closest you can get to someone who has passed is that plot in the ground.” At a mausoleum in Georgetown, where twelve-year-old Willie Lincoln was laid to rest in 1862, Ms. Marlin says you can feel a connection to Abe Lincoln who visited the site almost daily for three years. The University of Florida has garnered some practical benefits from Ms. Marlin’s fascination with the past and from her photography skills. 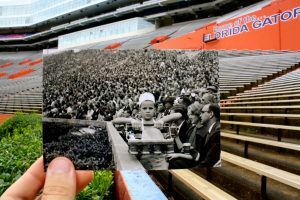 She has compiled a series of “Then and Now” photographs of the UF campus – superimposing a historical photo within a larger photo of the same scene. With the aid of her son and daughter – both UF grads — she would find the exact location where each old picture had been taken and then would snap a modern photo from the same perspective. In 2012, the UF Alumni Association distributed a Gator Nation calendar with a set of these composites, and, in 2016, several were featured in the local edition of Our Town magazine. You can see them all for yourself at http://www.dmarlin.com/uf-then-now/. If Ms. Marlin has a second passion, it’s playing the saxophone. In middle school, she learned to play the alto sax. In high school she was in the jazz, symphonic, and marching bands. While attending Santa Fe, she played tenor sax in the UF jazz band under legendary maestro Gary Langford. 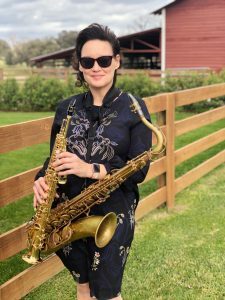 Forty years later she is still an active sax player – playing in the Gainesville Community Band, in church, at holiday events, and at weddings. But make no mistake, she puts a lot of effort into her work, too. She takes great pleasure in helping grad students to succeed. As she notes: “Students have it difficult enough with the classes, teaching, and research duties they have to undertake. The least I can do is try to ensure they can focus on their studies without distraction.” In a typical year, the department reviews nearly 300 applicants for the PhD program, makes offers to about 60, and expects around 20 to accept. This year the goal is more like 30 acceptances. Pam Marlin is the one who has to keep all the paperwork straight and see that deadlines are met. Two pieces of advice she has for prospective students: “Get your documents in on time and show why you are interested in UF.” These two things can really make a difference. After all, if you want a UF degree to eventually be a part of your past, history would suggest you have to make a good impression now, in the present. I think William Faulkner would agree.